"Don't ask, don't tell" led to the discharge of 261 service members in fiscal year 2010. The discharge numbers, released Thursday by the advocacy group Servicemembers United, comprise 250 separations reported by the Department of Defense and 11 from the Department of Homeland Security for the Coast Guard. down because this policy," Servicemembers United executive director Alex Nicholson said in a statement. 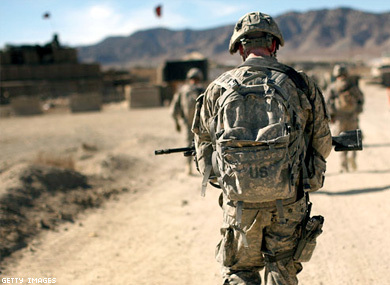 continue and service members are still in danger of being discharged. WASHINGTON, D.C. — Servicemembers United, the nation's largest organization of gay and lesbian troops and veterans, announced today that it has obtained documents showing that the total official number of "Don't Ask, Don't Tell" (DADT) discharges for Fiscal Year 2010 was 261. The annual fiscal year DADT discharge statistic combines the total number of discharges reported by the Department of Defense, which was 250, with the total number of discharges reported by the Department of Homeland Security for the Coast Guard, which was 11. "While this latest official discharge number represents an all-time annual low, it is still unusually high considering that the Secretary of Defense issued a directive half-way through the fiscal year to make it much harder for military units to discharge troops under 'Don't Ask, Don't Tell,'" said Alexander Nicholson, Executive Director of Servicemembers United. "Despite this law clearly being on its deathbed at the time, 261 more careers were terminated and 261 more lives were abruptly turned upside down because this policy." While these annual figures released by the Departments of Defense and Homeland Security are used to calculate the official DADT discharge statistics, which now stand at grand total of 13,686, Servicemembers United previously uncovered and reported that the Department of Defense does not actually release information on all discharges under "Don't Ask, Don't Tell." National Guard discharge numbers, which have yet to be released for fiscal year 2010, are often omitted from the official annual discharge numbers reported by the Department of Defense. This means that the total unofficial number of servicemembers discharged under "Don't Ask, Don't Tell" is now at least 14, 316. For more information about Servicemembers United and "Don't Ask, Don't Tell," please visit www.ServicemembersUnited.org. For the most comprehensive collection of polling data, discharge statistics, academic works, legislative and congressional material, and more, visit www.DADTArchive.org.